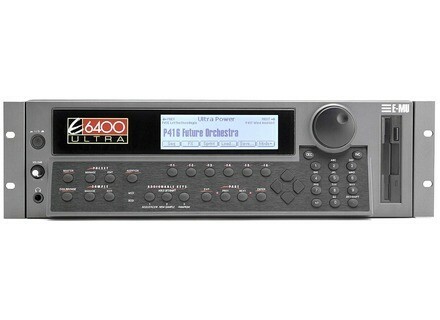 E6400 Ultra, Sampler from E-MU in the Ultra series. 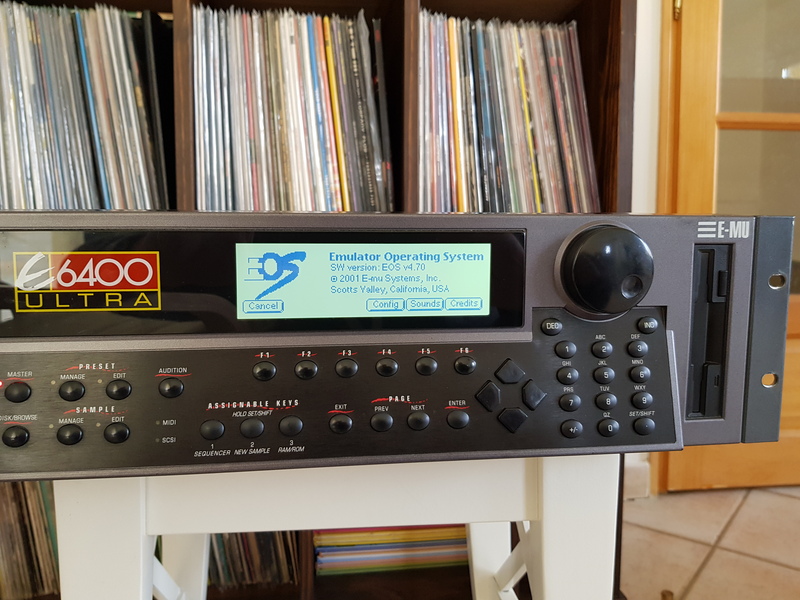 Alan Replica's review (This content has been automatically translated from French)" Excellent sound module"
I give my opinion here user, technical specifications are available on the Web. However, be advised that most of the specifications, the sounds, the connector (separate outputs, Midi, ..) memory, the polyphony are expandable by options. My Ultra is initially a demo unit of the socity E-MU reused by a studio film music. I bought used via eBay in the United States in 2005. It was already full of sound banks E-MU Ultra, E-Synth etc. 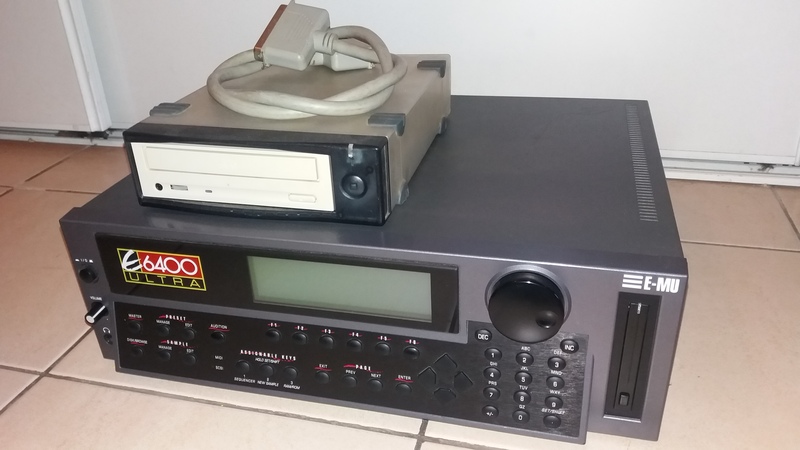 .. And came with 11 CDs E-MU. In addition it included the maximum configuration in terms of disk effects (RFX card) and memory. Quality effects: two separate simultaneous effects of quality, we regret the loss of the individual effects of each sound when on multiplayer mode, because the omni mode only allows two simultaneous effects of all sounds. however this is mitigated by the different effect settings applied to the 4 output buses (%), the ability to assign effects in multi compared to a no preset on a MIDI channel reference (that of No. preset can be changed during the game via a sequencer for example) but also be circumvented by resampling internal sounds with their initial effects. 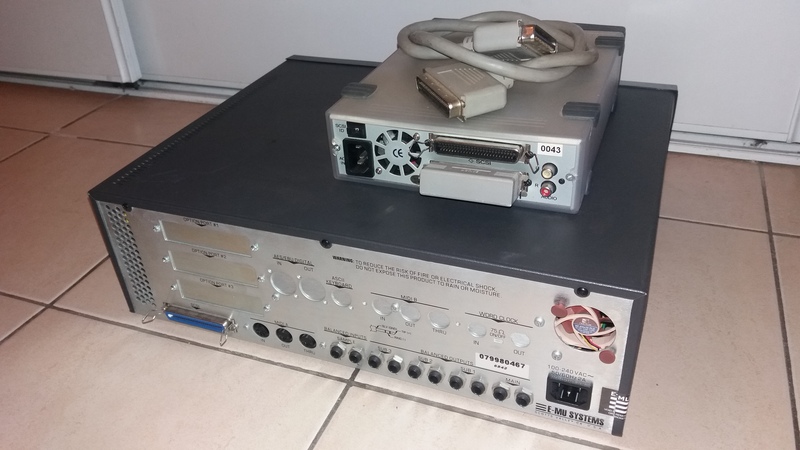 Personally I use the keyboard samplers EIII or EIV for sampling and sound editing, I transfered cepnedant sounds of EIII in the E6400 Ultra order not to carry the EIII. 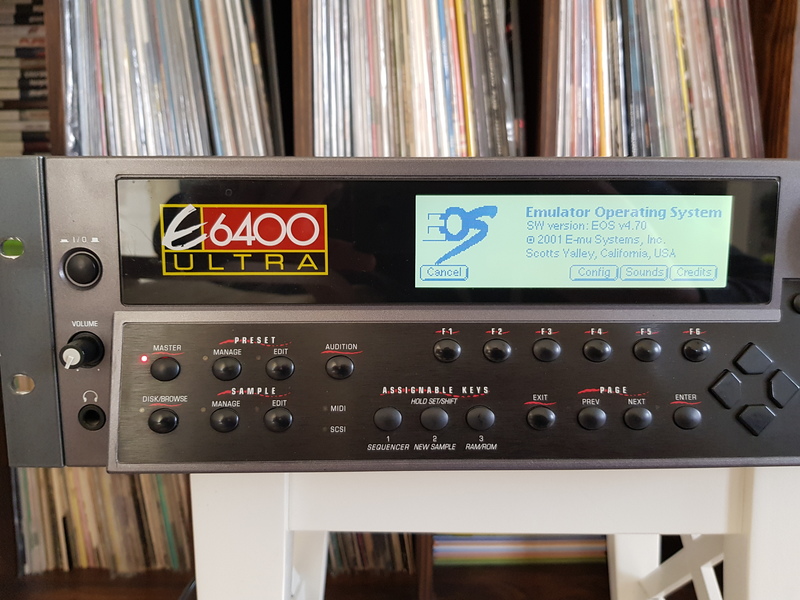 It is always possible to efectuer these operations via the E6400, but when you're used to synthesis modules and editing 'by ear' inherent in the EIII ..
-The arpeggiator is insufficient compared to the EIII arpeggiator fabulous! But for these two points, IVUS is identical .. It fails-assignable sliders for adjusting IVUS parameters of sounds in real time 'by ear' (filters, modulations), however EVERYTHING is assignable via internal commands and changed in real time, via a sequencer. Note that the sound quality is essential and filters that allow deep atmospheres as well as unmatched - E6400 Analog sounds! Small problem: electric guitars and saturation effects inconclusive for me, unlike the effect section 'Fuzz' on the E-MU Proteus MPS remains a must ..
speedrabbit's review (This content has been automatically translated from French)" Super Sampler"
Connections: everything, but no SERIES. Edition on Mac or PC. Ldition is not very simple, it is often prfrable to use a computer in order for the TRANSFR Defines and then the monster. The manual is thick and not easy Dhaka for a novice. Sounds with the grain amricain so special is a treat. They are expressive a wish and if ever you are missing something, it can. After 5 years of use in the amateur sampler continues to surprise me by its quality. The grain is excellent and I prfre far has competitors (roland, yamaha). Despite Lavni of any software I still prfrer has the flexibility provided by the hardware. He made me discovering a brand that I did not know what can and for me is an anthology. J'spre keep many more years. Effects gnraux (2 gnrateurs effect) not assignable track by track, because RFX card 32 as an option. No major problem, as long as it delves a little in the record. Only problem with non compabilit aiff or waiver of certain media. CHRE aka more than and less compatible with the rest of the Earth, is the choice of his plutt that the simplicity of use (which is not always justified ...) . This is exactly what I needed when I had to, but I think I would opt for one day a virtual sampler for pratica and save time in the studio (if I see that the following). impressive compared to polyphonic software versions latest issue 64 or 128 with extension. a hyper prcis timing for the surgical work! effects sufficient carrment monster with RFX! Z-plane filters that grow profondment your kicks and low ground ... a big win! The machine is easy and the general apprhender screen is intuitive compared to other "samplers more LGERS"
Producers of all English dance floor use and is not for nothing! Since 3-4 years I have been able to pay! GENIAL!